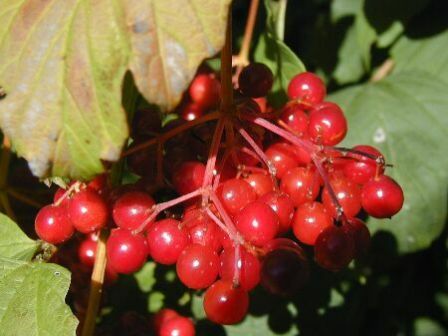 Highbush cranberry is native to Canada and the Northern United States. It mostly grows in nature in moist to wet soils of lake margins, slopes, or open woods. During the last few decades, it is also being brought under cultivation for its fruits as well as a plant for landscaping. A deciduous shrub growing upto 4 m; bark gray, rough having a scaly texture; stems arching and very dense, twigs reddish-brown. Leaves opposite, three-lobed, 6-12 cm long and 5-10 cm broad, with a rounded base and serrated margins; surface wrinkled with impressed leaf venation; leaf buds green, bud scales are valvate. 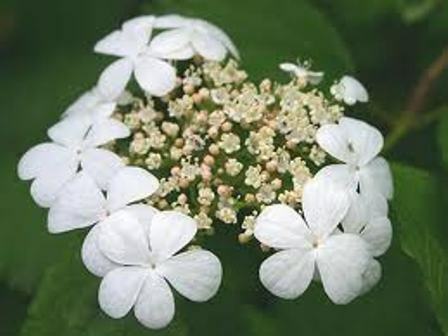 Flowers white, borne on corymbs up to 13 cm diameter; each corymb comprises a ring of outer sterile flowers 2-2.5 cm diameter with conspicuous petals, surrounding a center of small (5 mm), fertile flowers. Fruit is oblong red drupe, 15 mm long and 12 mm broad, containing a single flat, white seed. The fruits are edible and can be eaten raw. They are said to be a rich source of vitamin C. These are also processed into a very attractive sparkling jelly. In fact, highbush cranberry fruits are well known for this jelly. The fruits are also used for juice. The berries can also be used in pies, sauces, liqueurs, and wine. Each berry has a large, heart shaped seed in the centre, making it more suited for use as a processed fruit rather than fresh. The Natives of Canada used many parts of highbush cranberry for both food and medicine. The berries are high in vitamin C and were eaten fresh or made into pemmican. The bright red fruit was also used for ink and a dye for clothing. The bark and leaves, which contain a bitter tasting chemical called viburnine, were boiled into teas and used as sedatives and pain relievers. The bark and leaves may be boiled into a tea that is used as a sedative and to relieve muscle cramps and spasms. 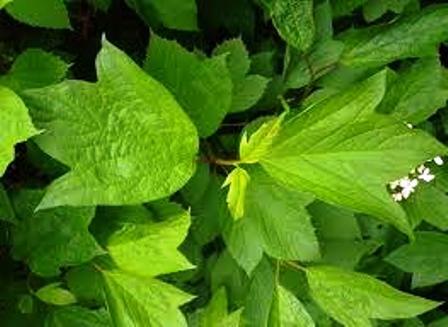 The bark, called Cramp Bark, is also used extensively to relieve menstrual cramping. 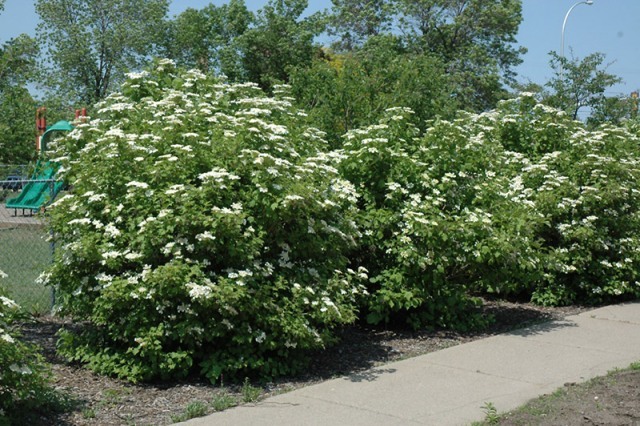 Cultivation of highbush cranberry is becoming popular for fruits as well as an ornamental plant. This shrub is considered a four season shrub, meaning it has attractive features for every season. So it is becoming popular for this purpose too. Andrews: A compact variety that grows to three metres. It will not get leggy like some varieties. The fruit is large and late maturing. Wentworth: Vigourous grower, and will reach its mature size of three to four metres quickly. It bears large clusters of early maturing fruit and has a very spectacular falkl colour. Garry Pink: Plants are similar to the wild growing one but has light pink flowers. It is relatively a shy bearer compared to other varieties. Garry Pink also has an outstanding red colour during the fall. Alfredo: This is a dwarf variety growing to two meters. Highbush cranberry is a cross pollinating plant, which means it needs pollen from a different shrub in order to produce fruit. Be sure to plant two or more varieties in your yard if you are planning on using the fruit. 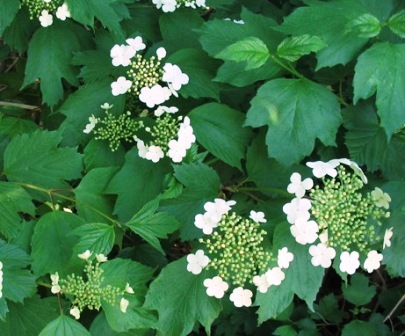 Highbush cranberry does not need annual pruning like some shrubs, but if you want to get the most fruit off of your plants light renewal pruning is a good idea. Renewal pruning consists of the removal of the oldest and thickest branches of a shrub. Prune the branches right at ground level. Leaving stumps will make the plant look messy, and give disease organisms a place to infect the shrub.